I’m Deni Kirkova, a health and fitness writer and bikini model competitor. I rave a lot about vegan protein, its benefits and sources, as well as the perks of a plant-based lifestyle when it comes to fitness. I have focussed on my macro split in the past when prepping for a show, so I’d make sure I was getting at least 100g of protein into my diet each day, around 150g carbs and 50g fat. But right now, I’m not tracking as I just competed and it’s a laborious habit that can take the joy out of eating! My ultimate best tip for getting a good amount of protein into your diet as a vegan is by supplementing your diet with plant-based protein powder, such as Vega. I recommend adding 30g to your morning bowl of porridge or chia oats, or 50g to a big pot of plain Alpro yoghurt with some berries on top for fruity flavour, vitamins and antioxidants. You’ll never be short of protein if you consume at least one of these options per day. 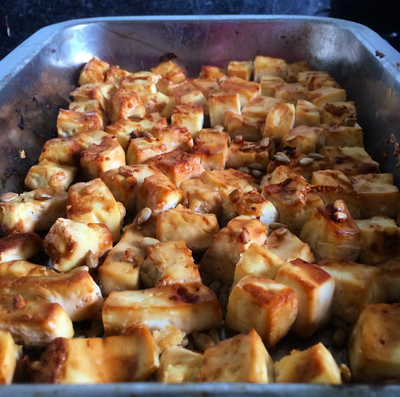 I simply drain a packet of plain Cauldron tofu, chop it into 2cm rectangular cubes, gently pop them all on a deep tray, cover with 2-3 tbsp of tamari / soy sauce, and, if I have them, a sprinkling of sunflower seeds, chopped ginger and garlic. I bake it in the oven at 200 degrees for 20-30 minutes, until golden brown round the edges, and serve with steamed sweet potato and broccoli. Optional additions: kidney beans, avocado, hummus, and sweet chilli sauce! 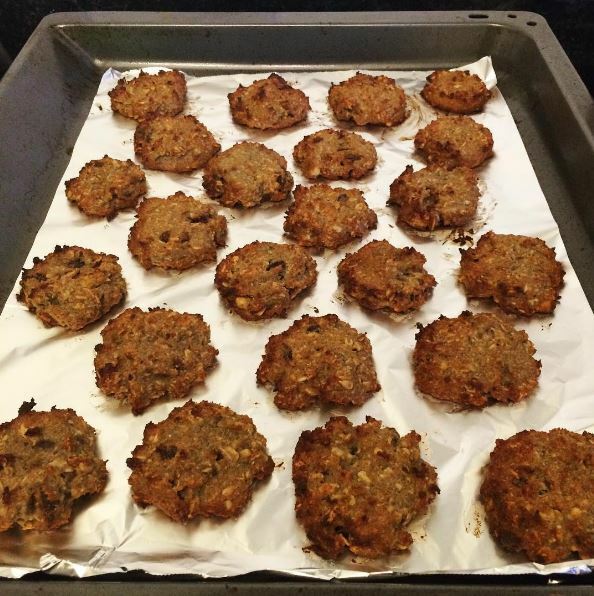 Another one is my famous protein cookies! Just five ingredients, super moreish and very macro-friendly. Made using 100g protein powder, 100g oats/muesli, 50-60ml Sweet Freedom fruit syrup (or agave, or maple), 2-3 tbsp nut butter and 200-300ml plant milk. You can add a few fruit, nut or seed bits or chocolate chips too. I always mix it up a bit when I make them but recently I’ve been adding chopped dates and a tablespoon of tahini instead of nut butter.